The R-Z Lab is excited to host a new lab member: Ashley Cecil is a Pittsburgh-based artist and illustrator specializing in paintings of flora and fauna that illustrate the interconnectedness between the natural world and its inhabitants. 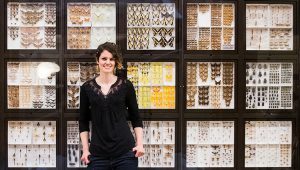 Ashley will join our lab in January of 2018 for a 6-month residency as part of a larger multi-year project where she will engage the public in scientific inquiry and nature appreciation through artwork and educational experiences inspired by the R-Z Lab and other hosts. We are excited to have Ashley join the lab, and can’t wait to see the work that results from her time with us!